This quality PCMCIA serial card adds a single serial port (RS422/485) to Notebook Computers. 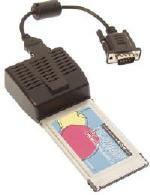 Supports 1 RS422/485 Serial Port with a DB9M Cable. Provides 1 DB9-Male RS232C serial port connector with a 15-pin to DB9M cable.